Belarus cuisine has predominantly Slavic roots. Along with a Ruthenian influence, it is also linked with Lithuanian and Polish because of the long intermingling of these three peoples; first within the Grand Duchy of Lithuania (11th-15th centuries) and later within the Polish-Lithuanian Commonwealth (16th-17th centuries). Though the Belarusian nobility, like the Polish elite, borrowed much from Italian, German, and French cuisines, this influence hardly made itself felt in the diet of the peasant majority. Still, some of the borrowed dishes spread throughout the society, such as lazanki (a mixture of flour dumplings and stewed meat, related to Italian lasagna) and, above all, various dishes made of grated potatoes, typical for German cuisine. Modern Belarusian cuisine is still heavily influenced by its recent Soviet past, and many local restaurants feature Russian or Soviet dishes rather than true specialties of local cuisine. Some Belarusians may have more interest in Italian, Chinese, and Japanese cuisine than in their own culinary heritage. However, draniki (both plain and stuffed), boršč, chaładnik, mačanka, zrazy, cold meat rolls, eggs stuffed with mushrooms, hałubcy, fried raw pork sausage and bliny are likely to be found everywhere, as well as sour rye bread. A traditional peasant or merchant's dinner consisted of just two dishes: soup and a main course. A special kind of pot, the sparysh, with two compartments, was used by farmers' children to bring lunch to their father working in the fields. Prior to World War II, salads or other snacks were not very common, and recipes based on Russian models tended to appear in modern Belarusian postwar cookbooks. Fresh white cheese and various kinds of cold meats (usually smoked) were available, however, at least on holidays. The word soup was not known in Belarus until the 18th century when the nobility borrowed it from German, but soup as a type of dish clearly existed centuries earlier. The old word for most traditional Belarusian soups was poliŭka (Belarusian: поліўка), except for those named after the vegetable that was the main ingredient: kapusta (cabbage soup), buraki (beet soup), gryžanka (swede soup). For a typical poliŭka the major ingredients (fish or mushrooms during fasts) were first boiled with spices; cereals such as barley or millet were boiled in the stock, and then flour blended with water, bread kvass, beet juice or buttermilk was added to the stock. Black poliŭka, made with goose or pork blood, is closely related to the Swedish "black soup" svartsoppa. Offering a matchmaker black poliŭka was the polite way for the bride’s parents to decline a young man’s proposal. Like the Ukrainians, Russians and Poles, Belarusians are fond of borscht, a thick and rich beet and cabbage soup made with grains, potato and meat. Soups are much more authentic, both hot (shchi, boršč, sorrel soup) and especially cold sour soups which provide cooling relief during the hot summer. The Belarusian chaladnik (Belarusian: халаднік), a cold borscht made of beets, beet leaves or sorrel and served with sour cream, hard-boiled eggs, and boiled potatoes, has been a popular dish also in Polish and Lithuanian cuisines since the late 18th century. The main dairy products include a kind of fresh white cheese (Belarusian: тварог) and sour cream (Belarusian: смятана), which is widely used both in cooking and as a garnish. Only in the mid-19th century was fermented cheese (Belarusian: сыр) borrowed from the Netherlands and Switzerland, and the local version of Edam was very popular for decades in the Russian Empire. Sour butter from the former Dzisna county was exported to England, where it continued to be the most expensive variety up to World War I. Today, however, these traditions have become a thing of the past. The traditional hard drink is vodka or harelka (Belarusian: гарэлка), including varieties made from birch sap (biarozavik, Belarusian: бярозавік) or flavored with forest herbs (zubrovka, Belarusian: зуброўка). 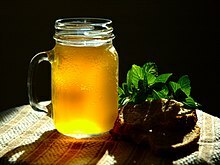 Mead and similar alcoholic drinks made of honey and spices were very common up until the 19th century and then more or less disappeared until the latest revival of the national cuisine. A notable example in this group is krambambula (Belarusian: крамбамбуля), vodka diluted with water, mixed with honey, and flavored with spices (nutmeg, cinnamon, cloves, red and black pepper). In the 18th century this drink competed with French champagne in Belarus and only wealthy people could afford it. Today it is enjoying a popular revival, as is evident from the appearance of krambambula recipes and histories on the Internet. The potato became so common in 19th century – there are some 300+ dishes recorded in Belarus – that it came to be considered the core of the national cuisine. In the Soviet Union, Belarusians were sometimes called bulbashi, a pejorative conjugation of the Belarusian word for potato. Wikimedia Commons has media related to Cuisine of Belarus. This page was last edited on 11 March 2019, at 21:51 (UTC).